I’ve become quite the connoisseur of cardboard over the past few years that I’ve discovered what a wonderful support it is for painting. I’ve painted in acrylics, oil, watercolor and gouache – and it’s held up beautifully. prep some cardboard supports and paint to your heart’s content. Read on for more info. First off, I discovered early on in my painting journey that I prefer hard firm surfaces to paint on. The only way one figures this personal preference out is to paint paint paint, and paint on paper, yupo, canvas panels, stretched canvas, wood, matboard, anything and everything. Stay tuned in to where you are most JOYOUS, that’s it! And that’s not to say that one has to stick with one support either, but it is a comfort knowing you can reach for that support that makes your heart sing. I’ve painted on lots of surfaces, and I’ve also gone near broke buying all these beautiful already prepped supports. I’ve tried lots of paper, stumbled upon matboard – which I had left over from a framing project, which I sealed with matte medium first. Just loved it. I paint rather passionately, not too gently, and the firm surface just works for my style of brushwork. From matboard I proceeded to cardboard….heck the stuff is everywhere. – I was taking it out to the recycle bin daily it seemed. Amazon boxes, wine boxes….it is ubiquitous. And being that I love to recycle and upcycle, I just had to try it. Being the techy nerd I am, I also called on the experts at Golden Paints and discussed my cardboard support idea and the proper way to seal it to make it as archival as possible. [Let me mention that in a recent museum visit to a Picasso, and another one of Pisarro’s artwork – they both had gorgeous paintings on cardboard!!! I figure I’m in good company. Smile.] The techies at Golden are awesome and I give them a big thanx for their counsel on this. 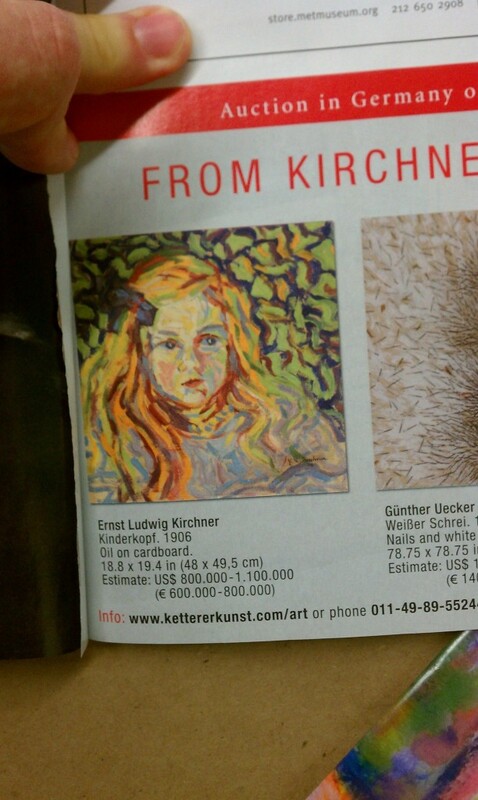 Just for kicks, look what I found in an art collector’s magazine not too long ago. Check out the listing price for this oil painting on cardboard! So here’s the thing about cardboard…….there is a cheap very pulpy cardboard – think import stores, dollar stores etc. Don’t go near that stuff. It will turn into mush before you know it. I’d recommend starting with wine boxes. You can get some nice sizes out of it and they are very clean and sturdy. Your grocery store should have plenty on hand. Furniture and appliance stores also have really clean sturdy cardboard – and of course, come in larger sizes…..
You’re going to need Matte Medium (you can use Gloss i just prefer the slight tooth of the matte), either gel or liquid, your choice. Remember this – BACK – SIDES – FRONT. You can’t forget the sides, that’s very important. Just shove the medium right into those corrugated ridges. Don’t worry about getting a solid seal all around, just enough to keep it rigid and waterproof. Seal the back and sides on the first go-round. It dries pretty quickly…about an hour or so. Before flipping it over to work on the front, mark a small “B” in one of the corners to indicate that is the back. 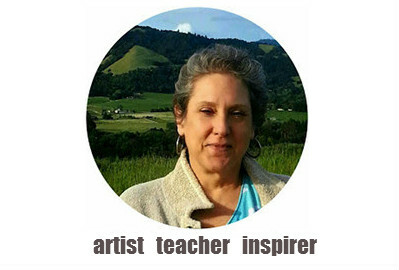 [That great tip was from Peggi Kroll Roberts – thx Peggi.] Now you are ready to seal the front. ONE COAT is all you need for all of this. Yep, you still have to gesso, or I do anyway. If I am going to paint in acrylic or oils, I do two coats of gesso on the front only. That will do it. If I am prepping for watercolor/gouache, then I do 1-2 coats of gesso then top that with either Golden’s Absorbent Ground or Daniel Smith’s watercolor ground. The latter is my current fave. STEP FOUR: PAINT FOR JOY! Here are some of the paintings I’ve done on cardboard and loved every minute, too – as well as being uber pleased with the results. [I started a new blog Jan 2016 so the links to my cardboard pieces are no longer available AND most pieces sold!] Cardboard is nice and rigid, yet very lightweight (perfect for plein air painting, too). And like I explained above, if you use GOOD cardboard and prep it properly, it will remain rigid straight, and firm for decades! NEXT WEEK in part 2 . . . I’ll share yet another awesome source for high quality cardboard that i just discovered. Just call me the Cardboard Queen! LOL.